(Columbus, OH, June 23) – Paul Holmgren didn’t want to take any chances with defenseman Kevin Marshall. 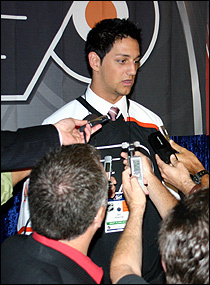 The Flyers’ general manager, who didn’t have another pick until midway through the third round, traded that pick as well as a second round draft choice in 2008 to the Washington Capitals in order to select Marshall with the 41st pick in the 2007 NHL Entry Draft. Kevin Marshall speaks with the local media for the first time as a Flyer. Marshall’s scouting report says that he is a stay-at-home defenseman who works hard. He has good balance and agility, and moves the puck well. There is also a mean streak to his game, something that always seems to resonate well with the Flyers’ brass as well as their fans. Marshall knows all about that, and thinks he will fit right in when the time is right. “I think that’s my kind of team. I play a rough game sometimes so I think they are going to like me,” he said. Marshall spoke with the Flyers at the NHL Draft Combine at the end of May. If the Flyers had held onto their 23rd pick in the first round (traded to Nashville for the rights to Kimmo Timonen and Scott Hartnell earlier in the week), Marshall could have been the guy chosen in that place. “He was a lot higher on our list [than 41st],” said Holmgren. Regardless, Holmgren managed to get his guy. Philadelphia chose left wing Garrett Klotz in the third round. Klotz, listed at 6’6’’ and 225 pounds, was not in attendance at the draft in Columbus.